Flourless Chocolate Chip Oatmeal Cookies are ready on your table in 25 minutes! These healthy cookies are made of rolled oats, honey, almond butter, coconut, eggs and chocolate chips. If you are looking for a recipe for oatmeal cookies without flour and sugar, you are at the right place. Flourless chocolate chip oatmeal cookies are made with rolled oats and instead of adding refined sugar, honey is used. 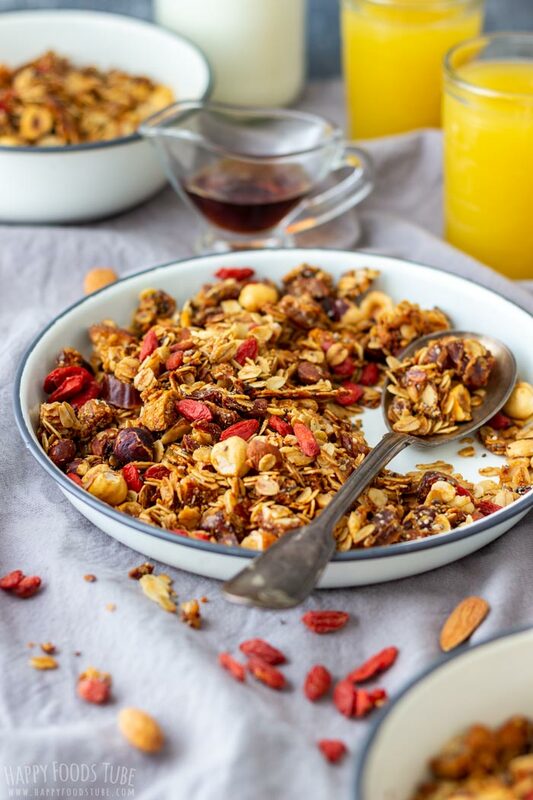 And if you are left with some oats, make super Healthy Homemade Granola! It’s packed with nutrients and it’s a hundred times better than the store-bought ones. How to make flourless chocolate chip oatmeal cookies? First, process the oats in a food processor – don’t turn them into meal. Just pulse several times to break them into smaller pieces. Get a bowl that is large enough to hold all the ingredients. A medium-size bowl will be fine. Throw all the ingredients in altogether with the oats and mix with a wooden spoon until well combined. Note that if you have coconut oil in solid form, you need to melt it first. Roll this mixture into balls and place them onto a baking tray lined with parchment paper. Using the back of a spoon or measuring cup, press each ball down to form a cookie. Bake them in a preheated oven for about 10 minutes. Can I make these flourless chocolate chip oatmeal cookies without eggs? To substitute the eggs, add extra almond butter. In this case it would be about 6 tablespoons. Now because you are substituting the eggs for something different, you have to bear in mind that the texture of your eggless flourless chocolate chip oatmeal cookies will also change. They will be soft when you take them out from the oven so they need to be cooled down completely before you can enjoy them. If you try to transfer them before they are completely cooled, they will fall apart. They also tend to crumble a lot so eating them can get pretty messy. I also recommend reducing the amount of honey to 1 tablespoon as the extra almond butter used is sweet enough to flavor them. Now that being said, they are delicious with or without the eggs but they hold their form better with eggs. This is an old post that has been recently updated and improved. In a food processor, pulse the oats several times just to break them into smaller pieces. Transfer them into a large bowl. Add the rest of the ingredients and mix until well combined. Take a piece of the mixture and roll into a ball. Repeat until you have used up all the mixture. Transfer the balls onto a baking tray/cookie sheet lined with baking parchment. With the back of a spoon/measuring cup press down each ball to flatten it. Bake in a preheated oven at 300°F/150°C for 10 minutes. Enjoy as a quick snack or a healthy treat. Desiccated coconut can be substituted with shredded coconut (Desiccated coconut is dried than shredded coconut). If you omit almond butter your cookies will turn out drier. For more information and tips I recommend reading the whole post. 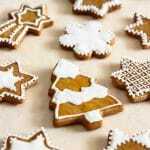 These cookies sound amazing, they look so yummy and I bet you can’t tell there is no sugar included in the mix owing to the natural sweetness from the honey and cranberries. Yes. You are right! There is no sugar needed – honey and cranberries do the trick! Thanks for stopping by! Thanks for sharing the recipe! Would this recipe still work if I used cocoa powder instead? Hi Stacey, I haven’t tried it but I think it would. They might be just drier so I would probably add more coconut oil. Please let us know how they turned out if you try making them! These cookies sound amazing. Love that they are flourless and healthy. Perfect for craving the sweet tooth. I love chocolate oatmeal cookies! They look so delicious! I love oat cookies. I can convince myself that they are a breakfast item haha. Haha, I have the same thinking. I absolutely love this recipe! It’s so easy and delicious! I’ll definitely be making again! That’s good to hear, Kim!